I perhaps have never written about Helicobacter pylori. Perhaps microbiologists working in clinical diagnostics know this as one of those rare organisms that gives an extremely rapid positive reaction for urease. Its usefulness as a protective factor for the pathogen against gastric acidity is well known. But who provides the substrate for urease production? Photo 1: H Pylori micrograph. First, for the naive readers a quick basics. H pylori is a microaerophilic, gram negative bacterium known for its spiral shape and motile by means of four to eight sheathed flagella. Its role in gastritis and peptic ulcer disease was not appreciated until Barry Marshall and Robin Warren showed it to be the case by drinking the culture (The story is quite famous and you could read about it anywhere on the net). Studies on global prevalence has indicated multiple subtypes in a variety of geographical regions. A greater interest has been its inverse association with autoimmune conditions such as asthma. 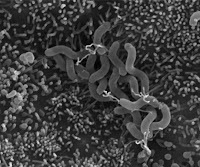 It has been shown that colonisation with certain subtypes of H pylori may have a beneficial effect. Urease forms the main part of bacterial defence. It protects the bacteria from gastric acidity. As a matter of fact, roughly 6% of the total bacterial protein content is contributed by Urease enzyme. The importance is also highlighted by a dedicated bacterial system for storage and sequestration of Nickel which forms the cofactor for enzyme. Urease is structurally hexapolymeric consisting of the two structural subunits, UreA (26 kDa) and UreB (61 kDa) bound two nickel ions. Urease gene complex also encodes an acid-gated urea channel (UreI) and the accessory assembly proteins (UreE–H). The standard theory is that Urea and H+ diffuse into the periplasm of bacteria through porins in the outer membrane. Periplasmic acidification results in a activation of UreI (via conformational change) permitting the entry of urea into the cytoplasm, where it is rapidly hydrolysed. The ammonia rapidly diffuses into the periplasmic space, where it becomes protonated, raising the pH to about 6.1, a level consistent with survival and growth. Coming to the question, who sources the urea? Though small quantities of urea and ammonia maybe found in the gastric region, they don't sufficiently account for the massive quantities of substrate required for neutralisation of gastric acidity. 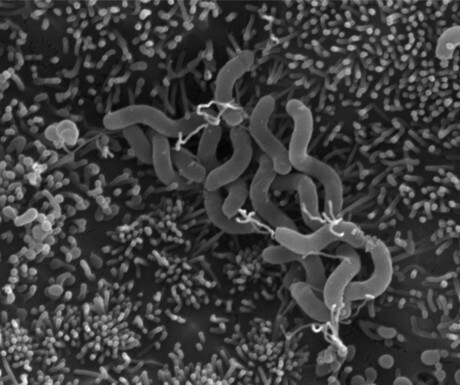 The bacteria relies on itself to make the necessary substrate. 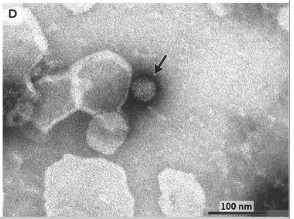 Through toxins, H pylori induces cell death in gastric linings and the released contents is used to extract arginine. This is used to obtain urea substrate via aliphatic amidase and an arginase. The whole system is controlled through a gene system which senses the environment. Making of urea and urease is shut down when the acidity levels are low thus allowing unwanted alkalisation of bacterial own proteins. After the big Ebola outbreak which was initially neglected for its potential, every outbreak has been well investigated and worked on. In the latest of the series, Zika is making a lot of headlines. I have previously blogged about Zika virus. The number of recorded cases have increased over the past month. By 1st February 2016, Zika has been declared as a global emergency. WHO director general, Margaret Chan stated, "I am now declaring that the recent cluster of microcephaly and other neurological abnormalities reported in Latin America following a similar cluster in French Polynesia in 2014 constitutes a public health emergency of international concern." Fig 1: Reported Zika cases in US. At least 33 countries have reported a minimum of one case. It should be noted that by December 2015, there was a dramatic increase in reports of ZIKV infection in the Americas. Brazil is the most affected country, with preliminary estimates of 440,000 to 1.3 million by end of 2015. A recent exact statistics is not available but the number of ZKV cases reported has seen an explosive increase, especially in South American geography. The virus has also been identified in the US, with latest case identified in Maryland. 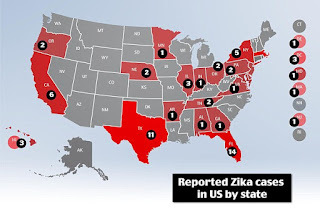 That makes it a total of 21 states with a total of 59 cases have been reported in the US. All of them are imported cases. UK has reported 4 imported cases. China has also reported its first case. Though India is seen as a region with possibilities of ZKV infection, press release has stated that there has been no reported case so far. The following Fig 2, gives a overall picture of the extent of ZKV spread on a global scale in the past 2 months. Data as on 11 Feb 2016. 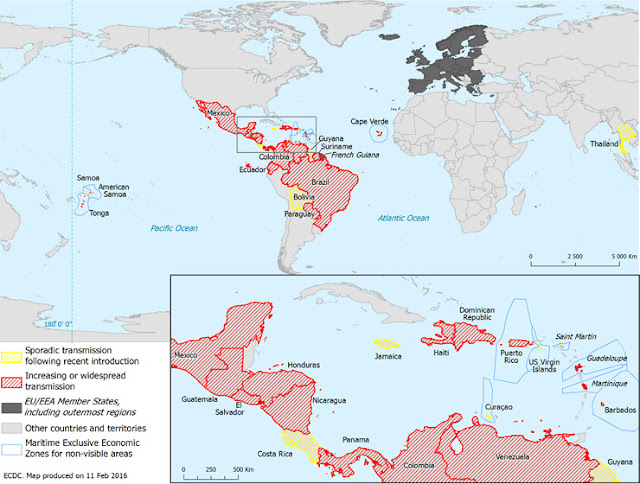 Fig 2: Countries or territories with reported confirmed autochthonous cases of Zika virus infection in the past 2 months. consistent with those of Flaviviridae viruses. Currently there is no specific treatment for ZKV or a vaccine. Many different sources has expressed an interest in developing vaccine. Bharat Biotech Ltd, has announced that they have 2 possible vaccine designs for Zika, and expect them to be tested soon. One is a recombinant virus vaccine and another is an inactivated vaccine. I have not been able to find the molecular details. With Obama administration seeking funding for research on ZKV there appears to more interest in studying ZKV infection. Much of its molecular details are unknown. Also several press releases have noted that US is probably collaborating with Brazilian institutes for a research deal on ZKV. Global recommendations for avoiding ZKV infection are not clear. Apart from surveillance, screening of travellers to effected country is recommended. Being a mosquito borne infection all precautions such as clearing mosquito breeding sites and use of bed nets have been recommended, especially for pregnant women. Evidence of sexual transmission is not documented, though some doubts have been raised. I have many a times talked about the current issues with Clinical microbiology- rising antibiotic resistance and too much of time taken for pathogen identification. The new 4th generation technologies are aiming at rapid workup with very high sensitivity. There is a lot of research on reducing this large turn around time. One of the systems that has more recently come into the market is MALDI-TOF based microbiology identification. I have been personally running some tests that for more than a year now. 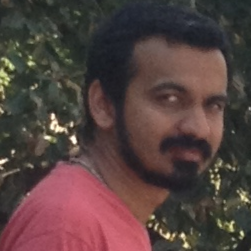 For the 200th post in this blog site, I think its worth a good share. 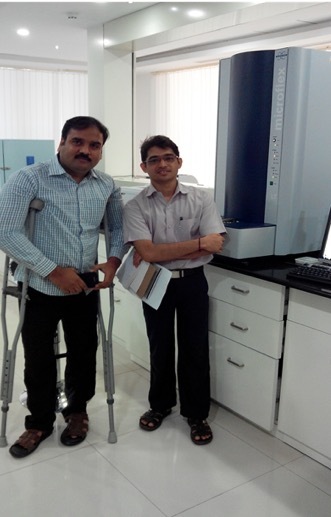 Let me digress a little bit and talk about Mass Spectrometry (MS). The credits of inventing MS is partly owed to findings by Joseph John Thompson and Francis William Aston. The modern MS was developed by Arthur Jeffrey Dumpster. MS is an instrumental technique used to calculate mass to charge ratios (m/z) and relative abundances for any given molecule. In this case m stands for mass and z stands for charge number of ions. Consider you have two types of balls one heavier and the other lighter. Assume that the balls are travelling at a speed and you have a strong air flowing in a perpendicular path. The lighter is the ball, easier is it to deflect its path. In essence, if you know the original path, speed and the force used for deflection, you can calculate the mass of the ball. That's pretty much how the classic mass spec works. An illustration of general outline of MS is shown in Fig 1. For different steps many different variants are available, of which most commonly used versions are shown. 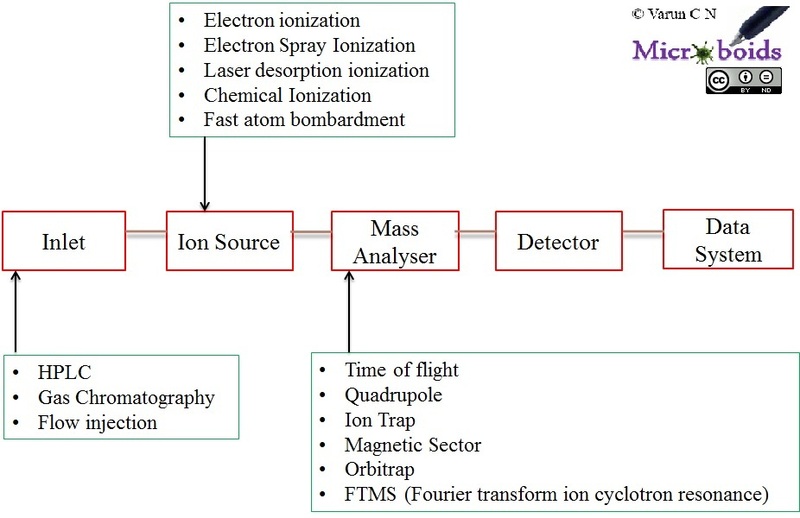 MALDI TOF is a build where the ionisation process is through matrix Laser desorption and detection is through time of flight. Hence the name- Matrix assisted laser desorption/ionisation- time of flight, or in short MALDI TOF. In the original studies, it was found that alanine could be ionised when mixed with tryptophan and irradiated with a pulsed 266 nm laser. It was identified with subsequent studies that there are better matrix which can confer better ionisation properties. Examples include- Cinnamic acid derivatives, Picolinic acid etc. In this case, the time taken for the molecule to reach the detector is calculated as TOF, which functions as the mass analyser. The m/z values generated is plotted as a graph. The trick in identifying the organism is to release the abundant protein such as Ribosomal proteins which have unique signatures for the species. With large scale studies a database has been generated containing m/z values for multiple species. The obtained sample plot is compared with the database and an algorithm calculates the closest possible match. An example of Mass spec comparison is shown in Fig 2. The upper part of the graph shows the spectra generated from my sample and the lower part from the spectra from database. For a closer look I have shown an example of detailed spectra in the higher molecular range. 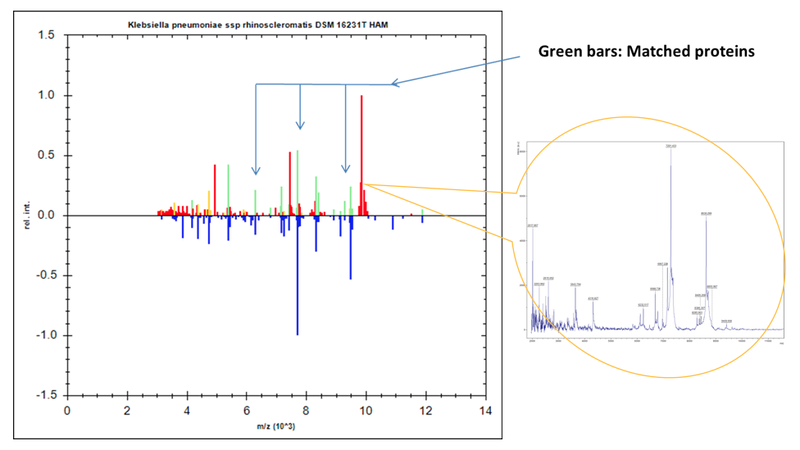 The red lines indicate the unmatched m/z values and green indicates good match. Depending on number of m/z ratio's matched the confidence in the identification varies. If database exists for strain subtype and similar peaks can be found in the generated spectra, strain typing can be directly done. That means there is an inherent limitation- "The database". For most of the bacterial isolates, obtained in fresh culture the proteins are easily release and ionised. The cultured bacteria is spotted on a MALDI plate, to which formic acid and matrix is added (I used α-Cyano-4-hydroxycinnamic acid reagent). The spots are bombarded with high energy laser. A representation of the process is shown in Fig 3. For more difficult organisms such as Mycobacterium species, a extraction step is recommended (I have tried with Acetonitrile extraction method). 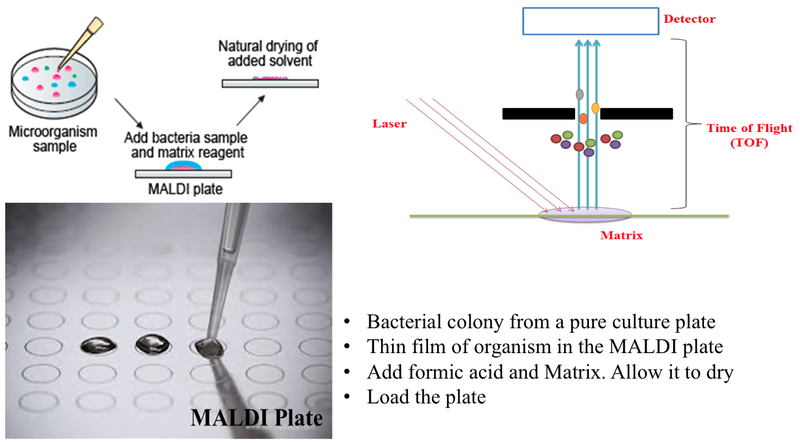 The MALDI TOF systems are used in multiple laboratories worldwide. The system allows identification of organism in less than 10 min. More recently techniques have been developed where the organism can be analysed directly from sample. For example in case of bacteraemia, the blood sample is treated with a reagent that reduces host proteins to a very large extent. Subsequently, MALDI TOF can be run with extract. Within an hour the results can be obtained. That is a huge leap from conventional method. With help of MALDI TOF, bacterial and fungal strains are well identified. As I already specified, the method is as good as the database is. Identification of virus would be an obvious target. However, most viruses have very few proteins. Additionally, they can't be independently cultivated. Hence, always there are a lot of other proteins in background which will mask the very few viral proteins. Despite the problems, attempts have been made to identify viral strain, with a small success percentage. The next challenge is antibiotic sensitivity. 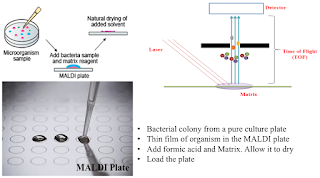 MALDI TOF MS inherently detects and creates a spectra ID for anything that you feed it. Antibiotic resistance can be due to a huge combination of protein changes and a database for every variant is seriously beyond the scope at least for now. But there is a possible alternative method for detecting some types of resistance. For example, if the system can show that a drug is being cleaved by the isolate then it must be resistant, irrespective of its changes in its proteins. An example of this is Meropenem hydrolysis assay. Strain is incubated with meropenem and MALDI TOF is run for the mixture. By looking for peaks which correlate with cleavage products of Meropenem, carbapenemase resistance can be indirectly inferred. The time of work can be reduced to about 3-4 hours. Now studies are also showing this could be done from sample directly. Overall, MALDI TOF is a great method especially when Turn around time needs to be as fast as it can be.